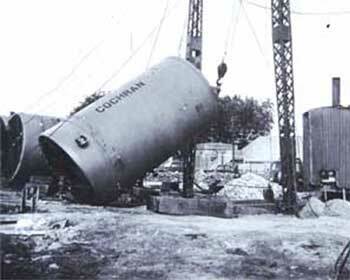 Copenacre Quarry was purchased by the MoWB in 1940 and, following an urgent request for underground storage in 1941, made available to the Navy. The estimated cost to convert the quarry was £192,500, but the Navy demanded the best of everything and within weeks costs had exceeded the agreed budget. In 1972 it was announced that Copenacre was to close, but with a staff of 1,700 this raised concerns. Following a Public Enquiry the depot was retained indefinitely. However, Copenacre closed in 1995 and was sold off in 1997. Click on the button above to see Copenacre. entrance of the air shaft.